If you look at most modern cars theses days, many of them will have machine faced alloy wheels. What are they exactly and how are the different from normal alloy wheels? And most importantly, can your machine face alloy wheels be repaired after you have had an unwanted encounter with your local curb? Machine faced alloys are just like any other alloy wheel apart from the fact that the face of the wheel has been cut with a CNC machine. The inserts on the wheel are painted as normal but the face has been cut back to bare alloy after which a clear coat is applied. This is what gives it that polished alloy look. You can tell if your rims are machine faced by looking closing at the alloy surface, you should be able to see tiny concentric lines where it has been cut. Can these mags be repaired?? Yes, fortunately they can be repaired as they are very expensive to replace and look terrible when damaged. This type of wheel can range from $800 to $3000 per wheel for a factory replacement. Thats up to $12000 for a set of four. Thats a vey expensive trip to the grocery store. There are two options when repairing this type of wheel. If you want the wheel to be back to a brand new factory finish you will need to take the car or wheel to a work shop. The Tyre will need to be taken off and the the face of the wheel will be re-machined with a CNC. This is a timely and costly process. You could lose your wheel for up to a week and the repair could cost around $300 per wheel. The second option is to have the alloy wheel repaired onsite by a mobile technician trained in machine face repairs. The damage will be taken out of the wheel and a silver will be used to blend in the repair before a clear coat is applied for a high gloss protective finish. Instead of waiting for a week to get your wheel back and forking out $300 plus dollars, the repair will take around one hour and will only cost around $140 per wheel. Better yet you can drive your car as soon as the repair is finished, saving you time and money. How will this type of repair look you might ask? 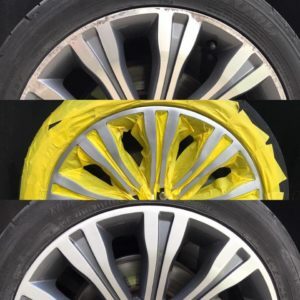 Although it will not be a full factory finish, with a highly trained technician most customers cannot tell where the repair has been made using this service, making it a convenient and cost effective option for when you damage your wheels next. At Platinum Wheel Repairs we repair machine faced alloy wheels daily in the city region. Contact us today on 0421136101 for a fast quote.